In 1995, newly diagnosed with celiac disease and motivated to educate others, Margaret Weiss Masiello left her lucrative career as a financial planner to go back to school to become a dietitian. One of her first jobs in the field was with the ALS Association Greater New York Chapter. The patients there were provided with physical therapy, occupational therapy, speech pathology, and mental health and nutritional counseling through weekly clinics. The multidisciplinary approach of this clinic struck a chord with Masiello as it acknowledged the effects that ALS can have on many aspects of life, and it made sense to target treatment accordingly. Masiello continued this interest when she began working as the dietitian and clinical coordinator at the Kogan Celiac Center at the Saint Barnabas Health Care System in New Jersey. At the helm of the center, Masiello soon realized that Saint Barnabas’ network of 18 hospitals and rehabilitation centers was in need of training on how to not only manage a gluten-free diet for patients with celiac disease but also recognize potentially undiagnosed or misdiagnosed patients. Masiello’s experience at the ALS clinic provided her with a multidisciplinary model she wanted to apply and further develop at Saint Barnabas. The timing was opportune. The National Foundation for Celiac Awareness (NFCA) had recently completed a needs assessment about celiac disease training in hospitals and confirmed that the call for educational services was great. As a result, the NFCA was developing a first-of-its-kind, comprehensive continuing education program for healthcare providers called GREAT Healthcare (Gluten-free Resource Education and Awareness Training). It was a perfect fit, and Saint Barnabas, with Masiello in the lead, was identified as the pilot location. When first diagnosed with celiac disease and instructed to follow a restrictive gluten-free diet, the treatment may sound simple: Remove gluten from the diet. But there is much more involved, making the “simple” solution quickly appear overwhelming, and patients often feel as though they are at a loss. What will they eat? How will they dine out with friends? Can they afford the expensive substitutions? That’s where GREAT Healthcare comes in. The program and its learning modules are designed to increase awareness about the disorder and guide healthcare professionals through the intricacies of the gluten-free diet so they can best help their patients. GREAT Healthcare consists of several modules—GREAT Dietitians, GREAT Family Practitioners, GREAT Nursing Professionals, GREAT Allied Health, and GREAT Mental Health—each designed to give healthcare providers in varied disciplines relevant information to support their patients with celiac disease. Each training program is approved for continuing education credits by its affiliated organization. GREAT Healthcare’s second objective is to supply focused information about celiac disease for providers so that patients can safely eat the food they are served while in a hospital, nursing home, or residential facility. In April 2008, the NFCA conducted a survey of people with celiac disease admitted to Philadelphia area hospitals. More than 50% of respondents who required food during their hospital stay needed family members to bring safe, gluten-free food from home as the hospital was unable to provide it. GREAT Healthcare recognizes that to provide safe food, the foodservice and dietetic staff need support from others who provide direct care to patients. Three million Americans have celiac disease, and a National Institutes of Health (NIH) consensus report for its treatment recommends that individuals consult a dietitian following diagnosis. What a bittersweet boon for the profession. There are two GREAT Dietitian options, and both are approved by the American Dietetic Association for continuing education credits. GREAT Dietitians-Food Service is tailored to dietitians working in the foodservice industry. The gluten-free marketplace is expanding rapidly and is expected to reach $2 billion by 2012. This GREAT program provides comprehensive and specialized information about celiac disease and supplies practical tools to manage gluten-free food preparation. GREAT Dietitians-Healthcare and Clinical Settings features some of the same kitchen-related information but has a greater focus on the clinical aspects of managing the restricted diet. Whether dietitians are working independently with clinical patients or are an internal resource within a large hospital, needed information is imparted in a useful, practical manner. Both programs provide a solid foundation about celiac disease and offer substantial information to help RDs recognize potentially undiagnosed individuals. Renowned dietitian, author, lecturer, and celiac disease expert Nancy Patin Falini, MA, RD, LDN, consulted with the NFCA on the development of the dietitian programs. After successfully completing either program, participants will have the tools to develop and manage protocols, be knowledgeable resources for their respective facilities, and have the ability to best support patients. After 18 months of operation, the Kogan Celiac Center remains the only dedicated, evidence-based celiac center in New Jersey with locations in two Saint Barnabas Health Care System facilities: the Saint Barnabas Ambulatory Care Center in Livingston and Monmouth Medical Center in Long Branch. The center offers screening services; separate monthly support groups for adults, teens, and children; and individual dietetic counseling. It has become a haven for newly diagnosed patients and those who have experience following the gluten-free lifestyle. The hospitals’ 18 foodservice departments completed GREAT Kitchens’ comprehensive “train-the-trainer” course. All dietetic staff are being trained, too, so Masiello will no longer be the sole resource for the healthcare system. The other GREAT Healthcare modules are also being offered to the staff at the various Saint Barnabas locations. — Loretta Jay, MA, is director of program development for the National Foundation for Celiac Awareness. For more information about GREAT Dietitians and the other GREAT programs, please visit www.CeliacCentral.org. Individuals may register for GREAT Dietitians or other GREAT Healthcare programs online. 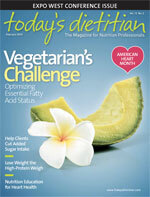 A special 25% discount for Today’s Dietitian readers is available until March 31. Enter coupon code TD0210. 1. National Institutes of Health. Consensus development conference statement: 2004. Available at: http://consensus.nih.gov/2004/2004CeliacDisease118html.htm. June 28-30, 2004. 2. U.S. Census Bureau. U.S. & world population clocks. Available at: http://www.census.gov/main/www/popclock.html. Accessed January 6, 2010. 3. Fasano A, Berti I, Gerarduzzi T, et al. Prevalence of celiac disease in at-risk and not-at-risk groups in the United States: A large multicenter study. Arch Intern Med. 2003;163(3):286-292. 4. National Institute of Diabetes and Digestive and Kidney Diseases. National Institutes of Health. Celiac Disease Awareness Campaign: Frequently asked questions about the awareness campaign. Last updated May 23, 2008. Available at: http://celiac.nih.gov/FAQ.aspx. Accessed December 17, 2009. 5. Rubio-Tapia A, Kyle RA, Kaplan EL, et al. Increased prevalence and mortality in undiagnosed celiac disease. Gastroenterology. 2009:137(1):88-93.